Research information is often fragmented across various systems and spreadsheets within an institution. This leads to administrative overhead, inconsistent and incomplete data and unreliable reports, all of which adversely affect business decisions. Pure can combine your institution's internal systems such as your HR, student administration, finance and award management systems, along with a variety of external data sources including pre-built researcher profiles through Profile Refinement Services, plus any legacy data into a single platform. Researchers, administrators and delegates enter supplemental data just once and personnel throughout the organization use the information in Pure for a wide range of purposes. Pure delivers your institution an all-inclusive view of your researchers' activities, areas of expertise and accomplishments. The content types in Pure, shown in the table, are highly interconnected so a user can identify a person through related outputs, activities, projects, funding and more. These relationships allow your institution to report across all content in the system without limitations. Pure provides workflows for data validation and control, so you know your information is accurate, authoritative and complete. Take advantage of Elsevier's Profile Refinement Service to enhance your profiles. Before importing Scopus data into Pure, our Profile Refinement Team subjects your researchers' publication lists to automatic name disambiguation and rigorous manual review. New publications are automatically added to each profile as they become available in Scopus. The result: peace of mind that your author information is accurate, dependable and up to date, with minimal manual intervention. Pure can also search the following external data sources to identify outputs associated with researchers at your institution. Pure retrieves the metadata automatically, saving researchers time and effort. 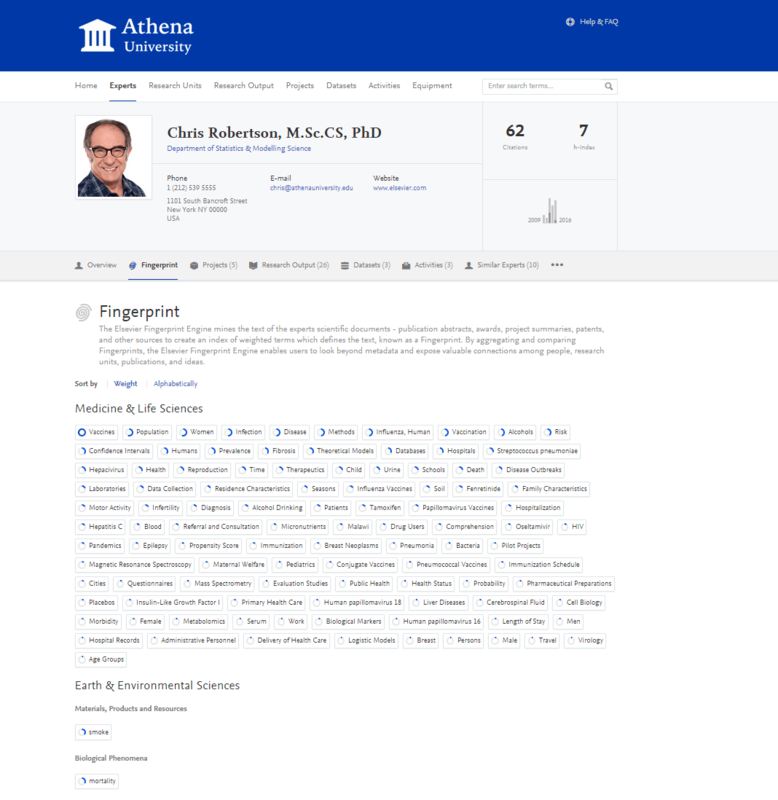 Pure makes it easy to create, update, and correct researcher profiles by automatically retrieving publication lists from relevant internal and external databases. Add additional content using a wide range of templates that provide structure for future reporting. By helping your researchers enhance their profiles with additional information on their scholarly activities, funding, intellectual property, creative works and other areas, your researchers can reveal a more comprehensive picture of their expertise and become even more discoverable by potential collaborators, both internally and externally. Trusted users can also enter data on behalf of researchers. Generate CVs and NIH Biosketches for different requirements at the click of a button, then export them as a Word or PDF file or publish them online. Your researchers exercise total control. They determine which profile data to include and personalize their content through customized headlines and free text sections. And because Pure updates sections automatically as relevant content is added, CV maintenance is effortless. To facilitate collaboration opportunities, Pure applies semantic technology and 10 different research-specific keyword vocabularies to analyze a researcher's publications and grant awards and transform them into a unique Fingerprint™ – a distinct visual index of concepts and a weighted list of structured terms. Integrated into Pure's search engine, Fingerprints make it easy to understand the meaning of an article, assess the expertise of a researcher or department, and identify research authorities in even the most specialized fields. Join the experts community and make your research programs and researchers more discoverable by peer institutions for potential collaboration opportunities. Search across the global community of Pure and SciVal Experts customers, plus a host of other platforms linked by the DIRECT2Experts initiative. Pure helps your researchers locate relevant global funding streams through targeted funding opportunity matches to their personal Fingerprints. Users can set up alerts, share opportunities and search or browse through our funding database containing over 20,000 active grants. Administrators can set internal deadlines, create dashboards, distribute reports and more, to help efficiently track, monitor and manage all aspects of the funding discovery process. Harness Pure's flexible reporting engine to generate and distribute validated internal intelligence to accelerate promotion and tenure evaluations, departmental and institutional assessments, and other vital requirements. Schedule Pure to run recurring reports at prescheduled intervals and email them automatically as a Microsoft® Word, Adobe® PDF, Microsoft Excel, or HTML file to your predefined distribution lists. Secure the best possible national assessment outcomes for your organization by taking advantage of Pure to streamline the demanding process to consolidate and submit critically required data. Pure has already proved pivotal for our customers to produce quick and effective full returns for the UK's Research Excellence Framework (REF2014) and Denmark's Bibliometric Research Indicator (BFI). Customers in the Netherlands will soon have the power to issue Standard Evaluation Protocol (SEP) reporting via Pure, as will those in Australia reporting to satisfy the country's Excellence in Research for Australia (ERA) initiative. Keep track of key milestones through Pure's powerful monitoring tools. Define objectives for any research team or department, then track and analyze progress by using Pure's customizable performance indicators – including Snowball Metrics – or define your own. View progress at a glance with Pure's high-level dashboards, drill down to person- or project level detail, and click to generate instant progress reports for managers, department heads, or other Pure users. Pure's customizable workflows help administrators track the entire research grant life cycle, from funding opportunities and applications to final awards. Enter funding opportunities into Pure, route them to researchers, and safeguard proper approvals for applications – including limited submission grants – by establishing sign-off routes that meet your organization's requirements. You can even trace your grant success rate by researcher, department, or full institution. Tailor Pure to your organization's needs through its optional feature-rich modules. Core The Core Module delivers an authoritative and connected data model with functionalities to enter, import, edit and maintain data. Portal This is the public-facing aspect of the platform. The Pure Portal is designed for the showcasing and discovery of research and it supports networking between researchers. Community Designed to overcome challenges faced in the management of multi-institutional projects, the Pure Community Module offers features for data collation, analytics, reporting and showcasing from multi-institutional groups. Pure enables you to exhibit your organization externally, promote your researchers and their accomplishments, and facilitate collaboration via a specialized web portal, known as the Pure Portal. Because the Pure Portal is online, it eliminates the burden of supporting separate online profile contact pages and can help facilitate cross-institutional collaborations, economic development initiatives and other external partnerships. The Pure Community Module facilitates the management of multi-institutional research projects, including data collation, analytics, reporting and showcasing. It provides a shared reporting engine and a multi-institution portal that makes it easy to collate and aggregate data, showcase research assets and even understand the contributions of each institution.